It looked a lot like this. Even had a mirror. That mirror has since been removed, repainted, and hung on the wall. 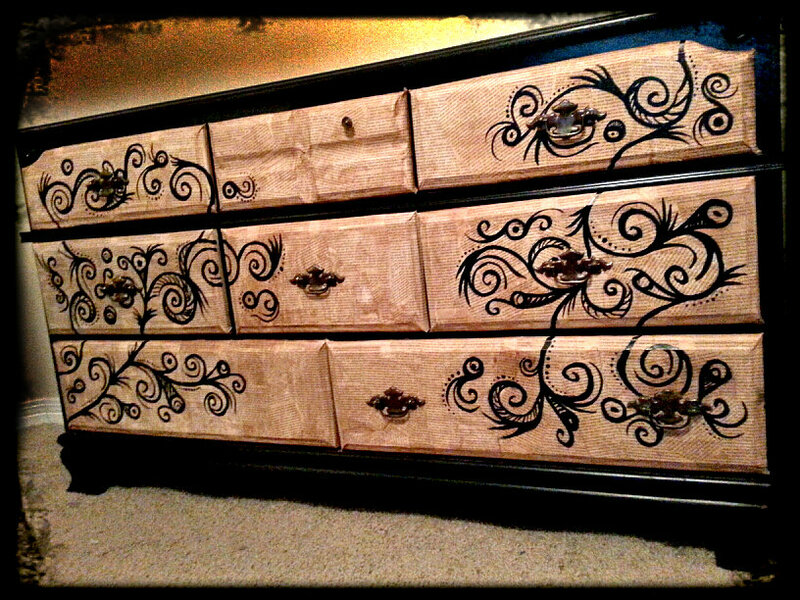 The dresser went through its first makeover for the girls room a couple yeas ago. It looked fabulous, wish I could find a photo 😦 It still looked great before this project but I’m moving the dresser to our room and pink zebra and fashion magazine modge podge just wouldn’t cut it. After stripping off all I could this is what I ended up with. 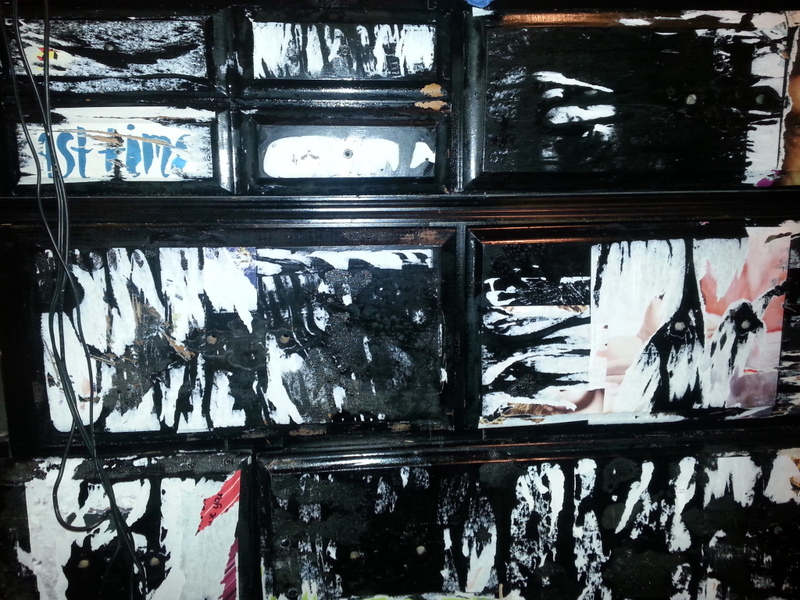 We had painted the dresser black already before the last makeover so we got to skip that step this go round. Supplies: Modge Podge, Old book, Black acrylic paint, Brown acrylic paint (optional), box cutter or exacto knife, Paint to paint your piece whatever color you choose. Step 1: Remove Hardware (handles and knobs) then paint entire visible surface whatever color you choose. I actually used black spray paint when I redid it for the girls the first time. Was able to spot paint a few scratches using my black acrylic this go around. 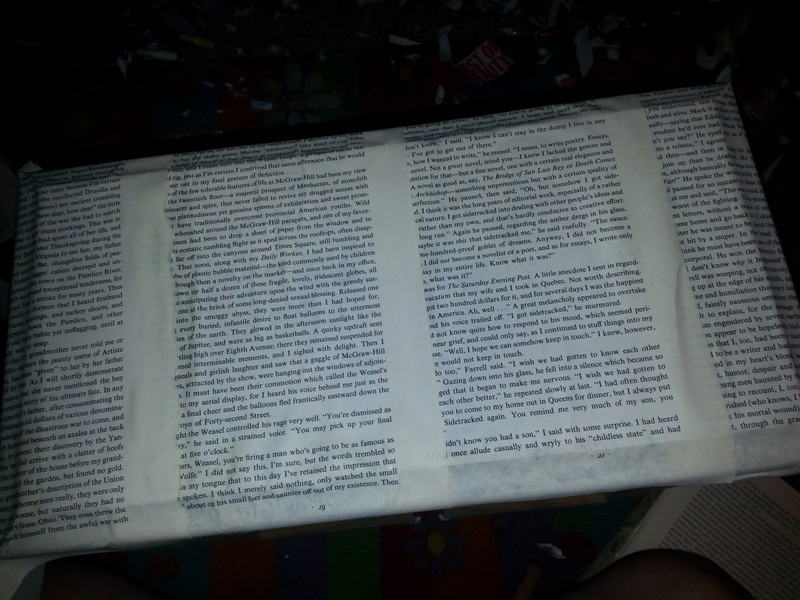 step 2: Tear your book apart. I find it easier to remove the spine and cover. 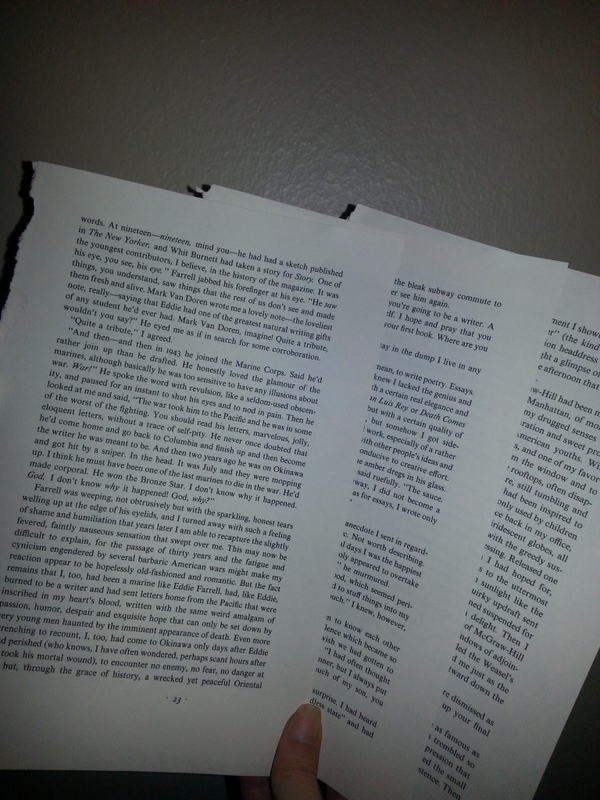 The pages will be much easier to peel away with minimal fraying. 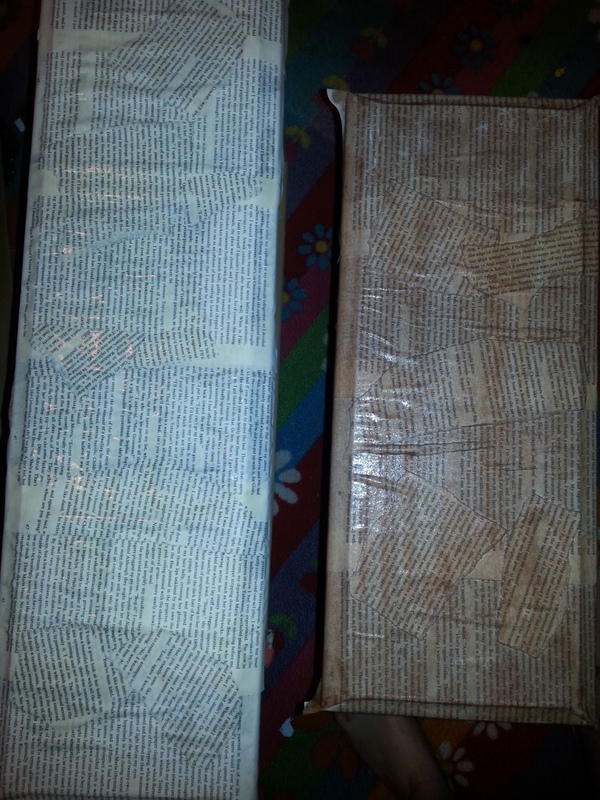 Step 3: Modge Podge paper onto each drawer. In my impatience I did not have actual modge podge. I used a elmers glue and water mix… I would not suggest that method as I had to go back and do a LOT of touch up gluing. Should have just went to the damn store for modge podge. Do not worry about over hang right now, we’ll get to that. Notice the bubble? Modge podge will help to avoid these and create a much cleaner look. I did not like the straight edge look so I tore paper randomly into rough edged shaped and covered part of the blank margin area. Step 4: You may like the slightly off white color. I wanted a more aged look however. Using the brown acrylic mix it with equal parts water. It will make a really runny brown stain (that sounded gross!). Brush this mix onto each drawer. I would suggest layering it as it tends to lighten as it dries. See the difference? The white was pretty but just not quite right for our bedroom. 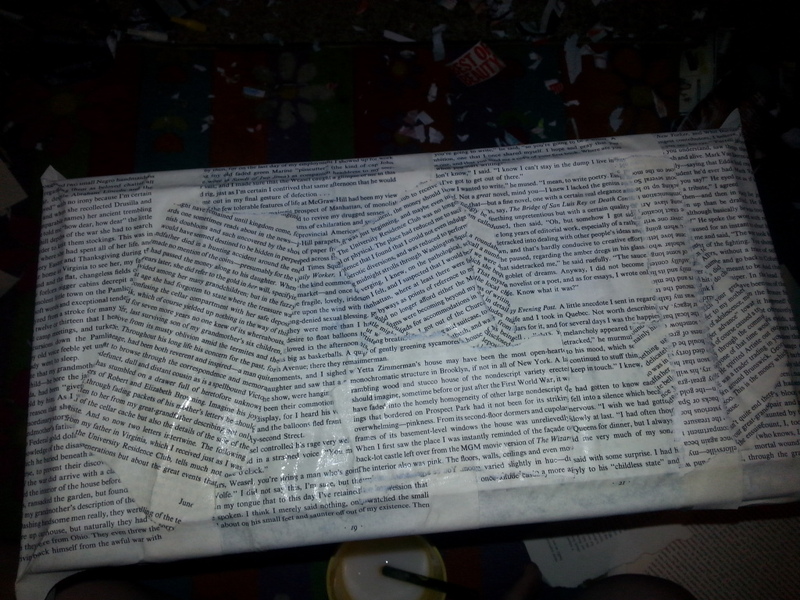 Step 5: Once everything had dried, trim the edges of your excess paper using a box cutter or Exacto knife. Wait till all glue or stain is COMPLETELY dry. It will slice right off without tearing this way. As you are doing this check your edges and be sure they are securely glued to the drawer. constant sliding will cause any unattached pieces to began to tear over time. You may want to seal it with a extra layer of modge podge once it is all done to completely seal all your pages together. Step 6: Put it all back together. 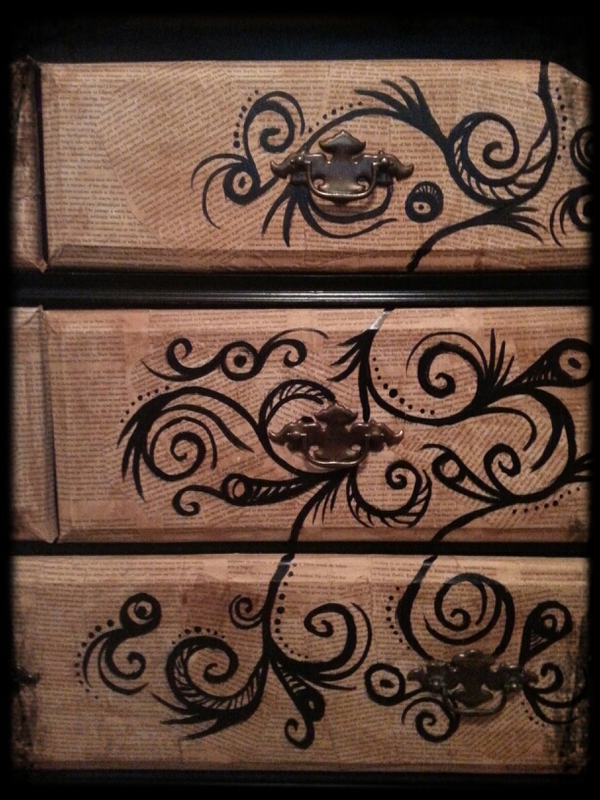 Pick a design or free hand a design onto drawers. Think of drawers as one complete piece. Here is each side of mine. I free handed a simple swirly line then just began adding elements to it. 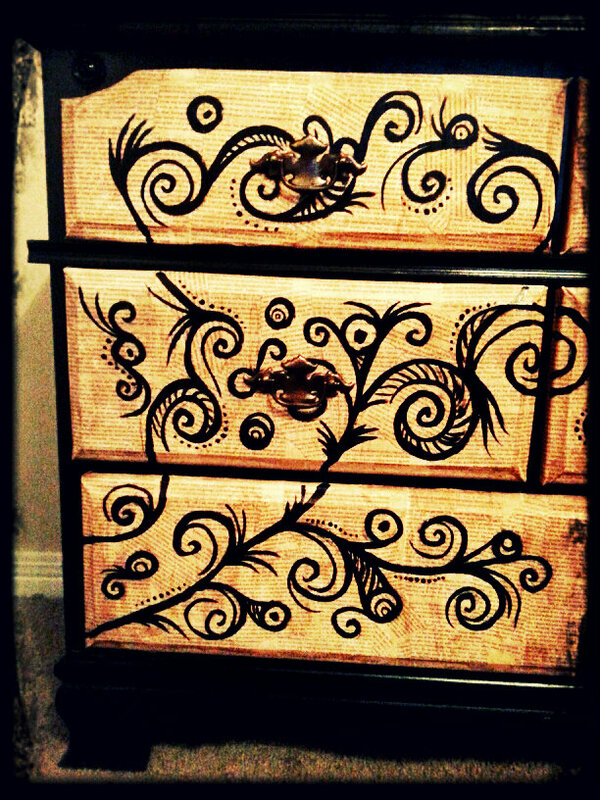 I originally wanted to do a deer silhouette but the spacing between drawers would have made it look deformed. Last step: reattach all your hardware. (This dresser has been through the ringer so I will actually have to replace most the knobs) I was in such a hurry to get this posted though I’m showing it pre-new-knob. Don’t judge me! VOILA!!!! 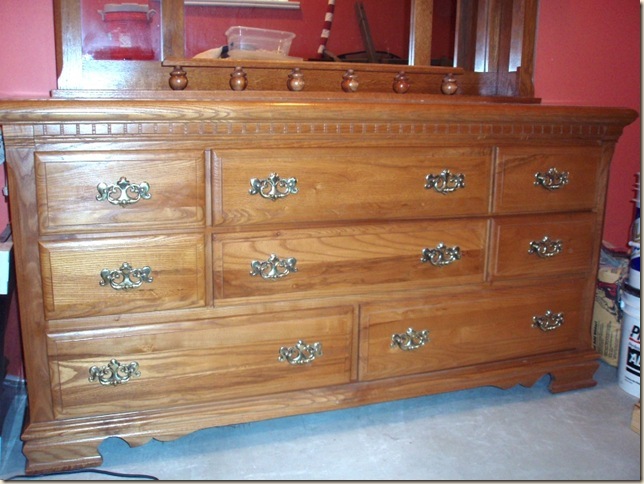 One of a kind Dresser! This entry was posted in DIY, Uncategorized and tagged Acrylic paint, Books, crafts, DIY, furniture, Makeover, Modge Podge, Paint, Recycling, storage, Upcycling, Wood dresser by Sunnie Wicker. Bookmark the permalink. That looks awesome! The design over the background is totally the icing on the cake! Why thank you. I was nervous it would look too tribal but it fits in our bedroom just right.